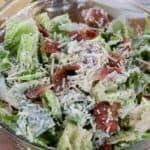 Caesar Salad is a staple salad recipe for a reason! 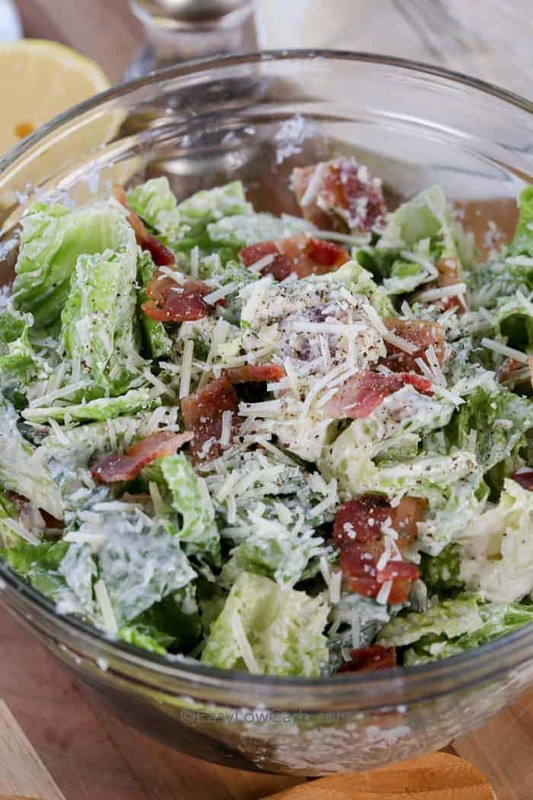 Crisp romaine lettuce, parmesan cheese and crumbled bacon are tossed in a rich low carb homemade caesar dressing for a side dish you will wish was your main! What’s In A Caesar Salad? Caesar salad has a few classic components to create the perfect dish. Romaine lettuce is the most prominent, it has large leafy greens and a stronger flavor than butter lettuce or iceberg. Next is the croutons, which we omit because this is a keto recipe. I find that the bacon works perfectly to keep the crunch you would normally get from the croutons, and who doesn’t like bacon? 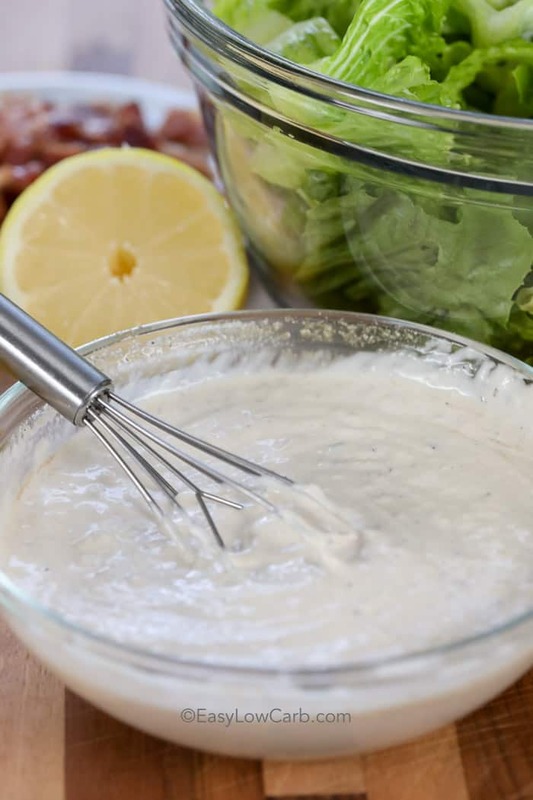 Caesar dressing is usually a creamy dressing, but vinaigrettes are becoming more popular nowadays! Let’s not forget the cheese; parmesan cheese is a strong cheese that has a ton of flavor – one of the main flavors in a caesar salad. Make sure you buy fresh grated parmesan or even grate it yourself. The powdered ‘grated’ parmesan or even pre-grated parm can have additives and hidden carbs! 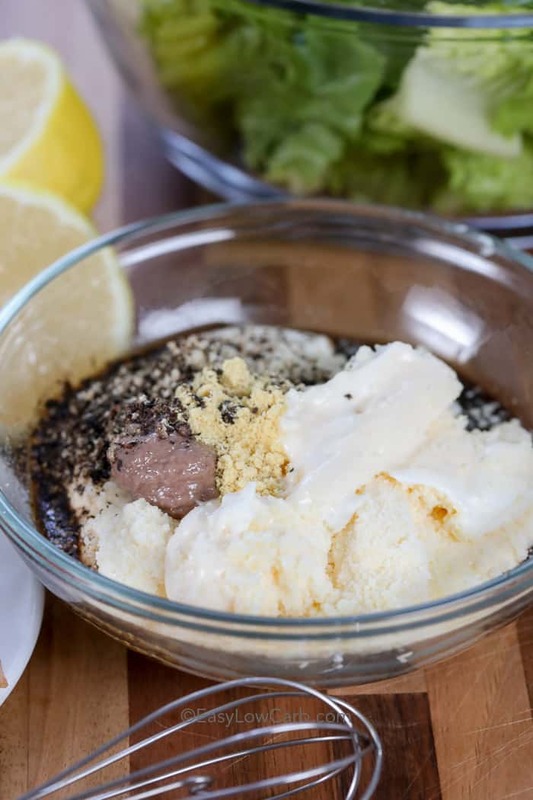 You are seriously going to love this low carb dressing recipe. I have used this dressing as a veggie dip, and drizzled on BLT lettuce wraps with great success. It works for anything! In a small bowl, whisk together the mayonnaise, sour cream, parmesan cheese, lemon juice, Worcestershire, pepper, garlic, and mustard powder. If the thought of anchovy paste worries you, fear not. You can’t tell it is in there, and it adds a richness and flavor to your caesar salad that you have to have. Once your dressing is all whisked together, you can store it in a jar in the fridge for an additional 4 days. Combine dressing ingredients and set aside (up to 2 days in advance). Wash, dry and tear yours romaine lettuce into a large bowl. Add the cheese, bacon, and the desired amount of dressing. Use less dressing to start, and add more if the salad doesn’t have enough! Toss everything together and serve it alongside a main dish like pork tenderloin with creamy dijon sauce. If you want to turn this recipe into a chicken caesar salad, add some chopped grilled chicken on top and you have a full meal ready to go! Place salad ingredients in a large bowl. Top with desired amount of dressing and mix well. Store any leftover dressing in the fridge for up to 4 days.